THE ENGAYGEMENT is an original musical adventure through the joys and tribulations of two men in New York City; the thrall of the first date, the bliss and the challenges of domestic partnership, and the victories of marriage. 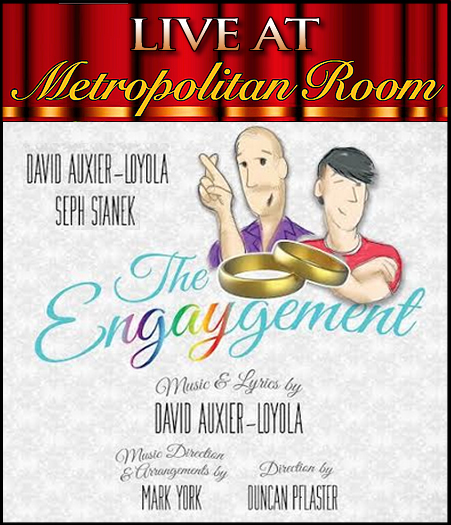 With music and lyrics by David Auxier-Loyola and musical arrangements by Mark York, you will take delight in the storytelling, both poignant and hilarious, through a wealth of classic musical theater style with a modern sensibility. CHRIS-IAN SANCHEZ made his solo debut with the National Chorale at Avery Fisher Hall this pass fall. Internationally, Mr. Sanchez has sung tenor soloist in mainland China with the American Hollywood Film Orchestra. Musical Theatre credits include Thuy in Miss Saigon in Miami, FL (Carbonell Award nomination for (Best Supporting Actor), Passin’ It On with Len Cariou, at Coconut Playhouse,Thoroughly Modern Mille (Ching Ho), Aida (Mereb), Grease! (Roger), Joseph…Dreamcoat (Judah) and Annie Get Your Gun (Tommy Keeler) at Surflight Theatre, Jesus Christ Superstar (James, the Elder) at K.C. Starlight and has performed all of the Gilbert and Sullivan repertoire with NYGASP. Mr. Sanchez has also performed as soloist in Broadway Backwards! 3 benefitting GMHC at the American Airlines Theatre on Broadway and has sung back up for Broadway veterans Telly Leung and Disney Princess voice herself, Lea Salonga. He is a graduate of the Mannes School of Music. ELLIOTT MATTOX A Kentucky boy, Oklahoma transplant and N.Y.C. resident, Elliott is excited to be part of The EnGAYgement! Regional: Patsy in Spamalot, Hugo in Bye Bye Birdie, Rocky Horror Show (Lyric OK); Robertson Ay in Mary Poppins and eight others (MTWichita); Hello, Dolly! (MUNY). Favorites: Jack in Into the Woods, Tobias Ragg in Sweeney Todd. Proud Oklahoma City University grad and AEA member. Thanks to David for having me be a part of this labor of love. Endless thanks to the most incredible family and friends in the universe for their constant love and support. Cheers! JASON WHITFIELD has cruised the Seas with Celebrity Cruises and performed at Disney in Orlando, Fl and Tokyo, Japan. Along the way Jason has performed many roles with some favorites being Ko-Ko in The Mikado and Frank in Annie Get Your Gun. Jason musical directs and sings with PartySingers NYC. He is currently a member of the New York Gilbert and Sullivan Players and a member of the St. Bart’s Choir, NY. Jason would like to thank his son Dawson and wife Christina for all of their support. Mark York (Musical Director/Arranger) has been David Auxier's personal pianist since 1992. Mark is currently the pianist and co-arranger for Just Jim Dale, which recently completed an Off-Broadway run at the Roundabout, and now London's West End. He’s the Executive Producer for The Ziegfeld Society, Music Coordinator for Jerry Herman and was Cy Coleman’s Music Assistant. New York credits:Sweet Charity starring Christina Applegate, Busker Alley starring Jim Dale/Glenn Close, director - Tony Walton, Ziegfeld’s Midnight Frolic of 2007, 2008 and 2010 starring Helen Gallagher, Jane Summerhays, Anita Gillette and Sarah Rice. Composer/lyricist: Galveston!-The Vegas Before Vegas, Rest In Peace directed/choreographed by Baayork Lee; A Midsummer Night, The Porker Sisters and 11 children’s musicals. Mark’s a native New Yorker from Oklahoma.